Pulled it and had a look, it's been played with. Can't tell if it's been swapped or just pulled out a few times but definitely evidence of it being tampered with, so may have had a standard ECU fitted at some stage. Yeah have noticed it seems to be missing a few things, judging from photos online though there seem to be a lot of genuine ones that are also missing a lot of them too, not sure why though. Good article to read, much appreciated for the info thanks 😊. Yes got in touch with them this afternoon, emailed photos and details off so now patiently waiting to hear back 🤔 Yeah I hear you on that one, and will apologise if my reply earlier today sounded a bit defensive - got swamped with people telling me it's a fake with no real info other than "it's missing this bit here or there", and I guess was more just wanting time to research it myself fully. Looking at the Alpina Archives on this page there were a few that went to Japan, in black, with the gold trim and cloth seats. Also, going through the photos of the actual cars, it seems like boot spoilers, pinstriping, interior trim etc. was all customisable, as most have subtle differences - how much of that is previous owners changing (or replacing items with anything local/cheap) things and how much was ordered that way, no one can say. So will wait and see what the archives says first, and go from there. Either way, it is a cool car. Very tidy inside and not bad on the outside. If it is just a riced up special, no harm done given what I paid for it - and, if that is the case and it's a stock standard 735iL, the badges will most likely come off and it'll become just a nice weekend cruiser. Given it's condition and extremely low k's, either way I think I got a decent bargain for the price of it. You don't come across these every day in this condition - not even the ashtrays or the lighter look like they have ever been used. So this project log may become more active, if it isn't what it was sold as. Get it running, exhaust, decent wheels, tints..... nice Mafia ghetto style car to cruise good old Invers in 🤣🤣🤣🤣. Hi, Is anyone interested in buying my e28... Im moving into an apartment and I just dont have the space anymore for a spare car. Its mint, No rust, I am replacing the sunroof with a new one Ex germany, just had the front resprayed as it was clear faded. the 17 inch style 5's are in good nic, could used a prepsol polish, it has a good modern stereo with sub and amp in the boot. Car has Aircond, but needs regas Hoping for around $7,000? ***Alternatively if someone wants to give me a price to swap a M5X or S5X motor and box in I would look at keeping it, just sick of the constant niggles with the m20, i have a young kid and another on the way so no time anymore. However, those two identical vehicles very rarely exist, and there are many, many more important things that NZ new in determining the value. The majority of "NZ New" cars I have seen have been either poorly optioned and / or badly serviced with badly stone chipped bumpers and bonnets. Ahh baby sh*t yellow with old man khaki trousers interior. Obviously not my favorite combo. Nah... one day, Bieber will be Old Skool and cool. 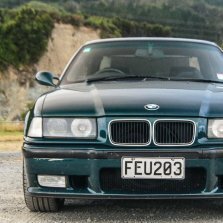 I think there's a moving target at play, newer cars will appeal to a younger generation just as E34s (for example) appeal to a lot of current 40 year old BMW fans. Jebus crumbs... why can't the world just forget Bieber!?! This will be interesting to observe because I anticipate the E9x M's (and beyond) will only have future appeal for fanbois and not enthusiasts. And I think it's enthusiasts (and scarcity) that protects the price somewhat. My money is on E9x's being worth less that E46's in a few years time and probably worth less that a good example of an E36 M. I accept that what I "think" may never become reality but that's where I am at the moment. Nevertheless, if you have a 22k budget you have a 22k budget and if Phoenix and SMG suit then this is worth checking out. I'd pay more to have just about any other colour to be honest. IMO they look horrible in yellow... I reckon more E46's will be hitting this price range soon because the early E9x M3s are in the 30-40k range now. Guido at BM Workshop City got it going, Ross Lamb at BM workshop has a few other things to do on it and thru him Gavin at Hivelocity for tuning. Once the works complete (which includes a good bit of new exhaust) it'll go back to Gavin I hope to tune accordingly. All the best Graham. as an aside, going into business for yourself is a courageous move, and is truly tough in this world of cowboys and laypeople. Side hustling on the other hand, is a hit or miss. Ok so I haven't posted more pics just yet as I said I would, been busy with other stuff (work mostly 😞). There are a couple of stickers that I'm a bit sceptical of in the engine bay they just look wrong (one says Alpina but has a barcode? ), but also a couple of tags that "may" be authentic. One in the engine bay that says it's Alpina build number #15758. And another on the dashboard that says the same. These don't look like a Japanese badges special.... will upload pics when I can. Plus scans of the paperwork when it was imported. And I've also been in touch with Alpina, for the cost of $150 I'm gonna risk it, if it turns out genuine they will give me a certificate of authenticity, plus a build sheet. So either way, that will tell us all if it is a stickers, badges and pinstriping special, or the real deal 🤣🤣🤣🤣 Will see if I can upload all the pics into a project log and copy the link here to make things easier Log has been started for those that want to ask/know more, will do my best to answer everything and keep it updated. You should see some of the late model NZ cars we get at work that have lived near the sea in Petone or Seatoun. Held together with orange flakes. Best mod I have done (e90 335i) ! What is BMW thinking putting those tyres on sports cars? The car feels and handles so much better now. Completely transformed it. A cigarette lighter powered tyre pump and a can of tyre slime from Repco or Supercheap, and you're covered pretty well really. Had plenty of punctures on my non runflats and the tyre pump always kept me going long enough to get to a tyre shop, still haven't even needed to use the tyre slime. The flat tyre monitor picks up pressure loss long before it's flat so you get plenty of warning. Runflats are a bad joke.